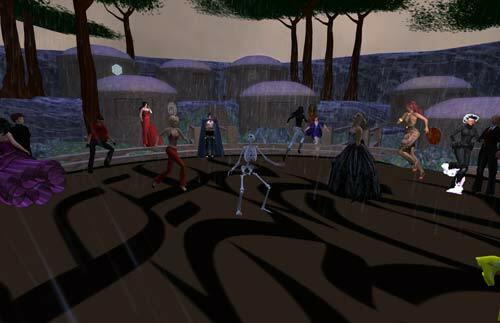 Since MO:RE has gone on indefinite hold, many fans have moved to Second Life. 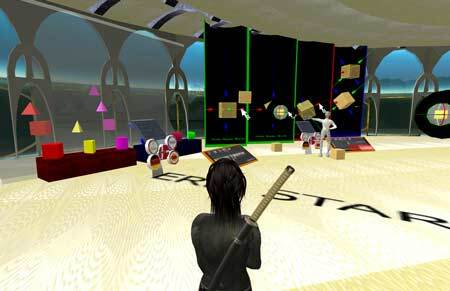 Something over 500 fans are there and leaning to build in the simpler universe of SL (Second Life). 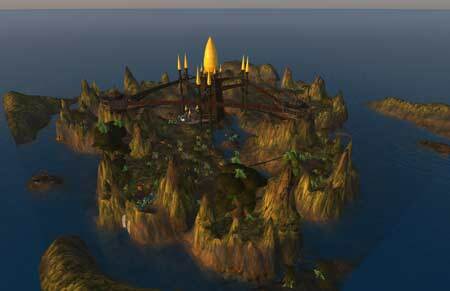 The areas of the D'ni universe rebuilt in SL are not the quality of Cyan's D'ni world. 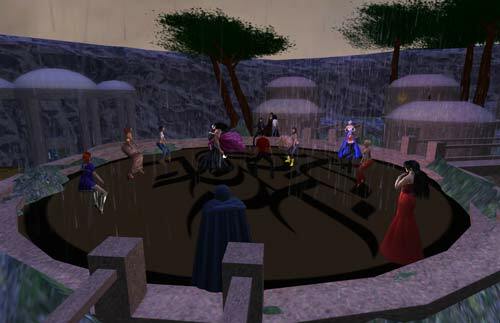 However, explorers are walking and dancing in the SL D'ni ages. ddb174 put up images of the fan created ages here. Some SL regions and some MOOS ages are made by novices with varying levels of skill. 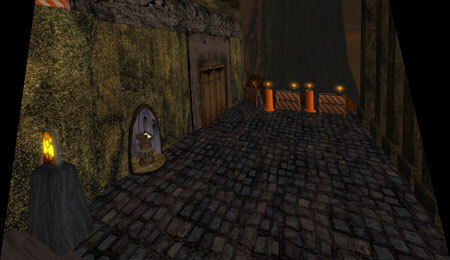 Having attempted my own MOOS age and building in SL, I know how challenging it is in both. 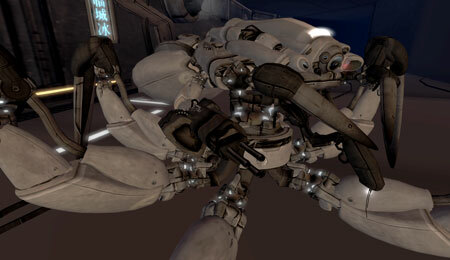 On the other hand some ages/regions in both groups are made by professional 3D modelers (e.g., Svarga in SL). 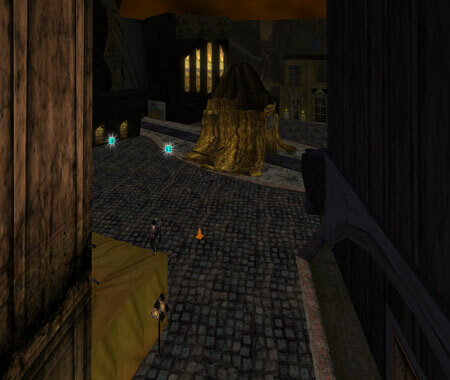 Those familiar with the City and those that have walked the Path of The Shell will recognized this part of the city. 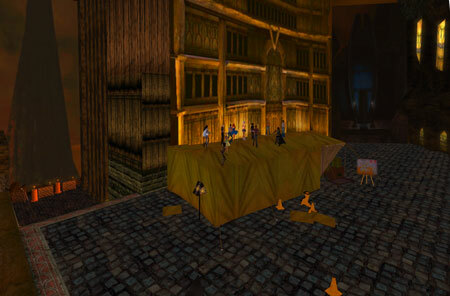 New Uru style regions are being built in SL. I soon hope to have pictures of those. The top of the Great Stairs in Ae'gura. Ok... some things are not exact... but one can recognize the plaza and central stalagmite. The Gallery in Ae'gura. (Right) - Forest in SL (below) Thend in red shirt. Beautiful places... Good reproduction, considering SL limitations. 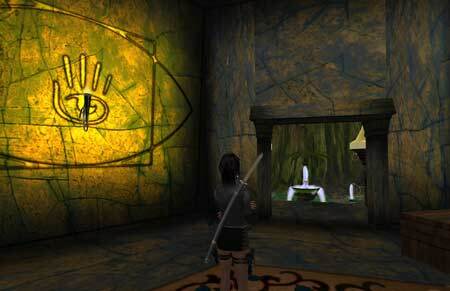 (SL graphics have improved in 2008). Getting around in SL is a not much of a problem. The arrow keys or a standard AWSD key set work. However, there is a lot to SL. 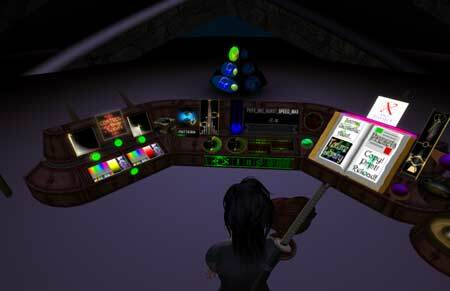 Setting up your AV, learning to use teleports (sort of like Uru linking books) and finding things is... well... not so complex as it is different. It takes some learning. The best tip I can give a noob to SL is to use search, find an Uru or D'ni group (D'ni Refugees is a favorite of mine - the party group). Join the group and IM to ask for help. Search, join and then open the chat dialog (button on bottom row) and switch chat to GROUPS (bottom tabs in chat dialog) then IM/CALL (type your message - everyone can see typed IM. Not every one can hear voice chat). 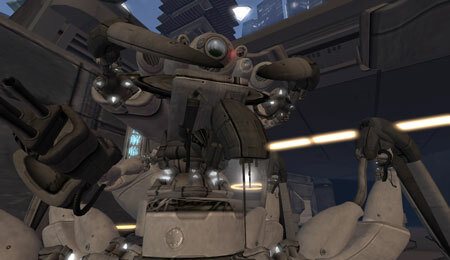 There is a large Uru SL Visitors Help Post on GoMa forum. 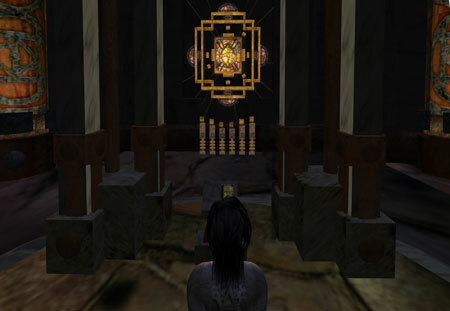 Check it out for help on visiting SL and finding the Myst/Uru community. This is a fully functional moving controllable robot. THe legs and joints work. Actuators move the head and guns and it makes whirring sounds. It is amazing. The images do not do it justice. 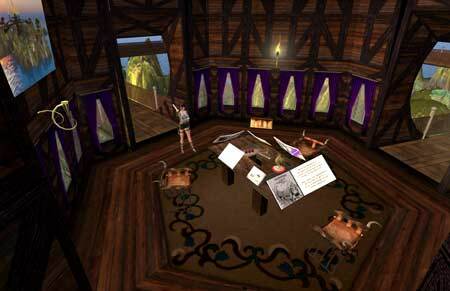 This one and the nest two were added to show some of the detail possible in SL builds. You may notice there are no shadows. I have them turned off to reduce lag in game. There is no water here, but if there were you would not see the reflections because I have those tuned off too. 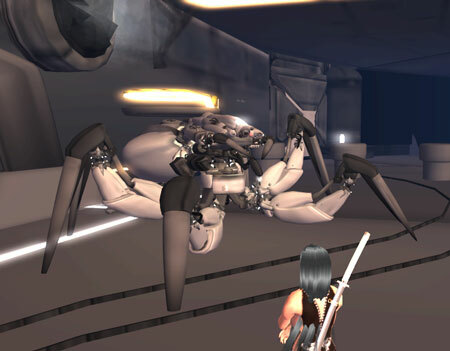 One can have a very high level of graphics quality in SL provided they have the computer to support it. The top image is raw untouched capture. THe lower is a Photoshop tweak of the levels to pull out detail. 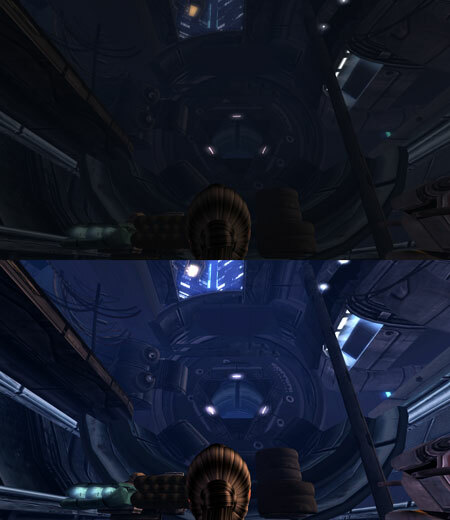 One can change their viewer setting so that there is more light and different levels of ... visibility ... in game. 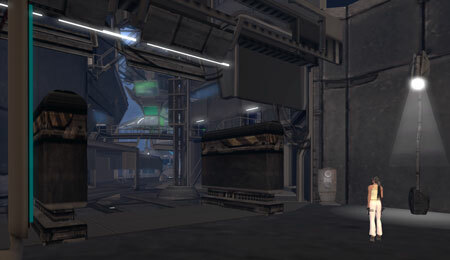 This is an RP region in SL named INSILICO (cyber punk rpg). These images are shown for a post on GoMa. 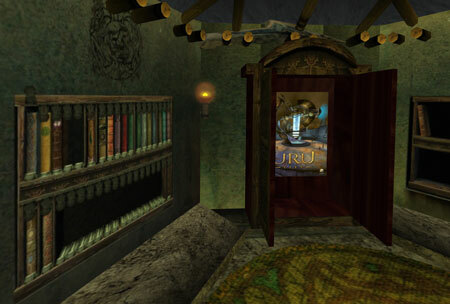 This is a room in Svarga. A very well done island built to simulate an ecosystem. It has a very Myst like feel. 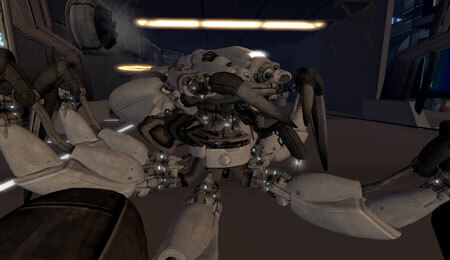 It is a good example of the work a pro can do in SL (former game developer). The texturing is extremely good.